Caption slip reads: "Photographer: Snow. Date: 1955-11-30. Reporter: Phinney. Assignment: Class pin in hospital. 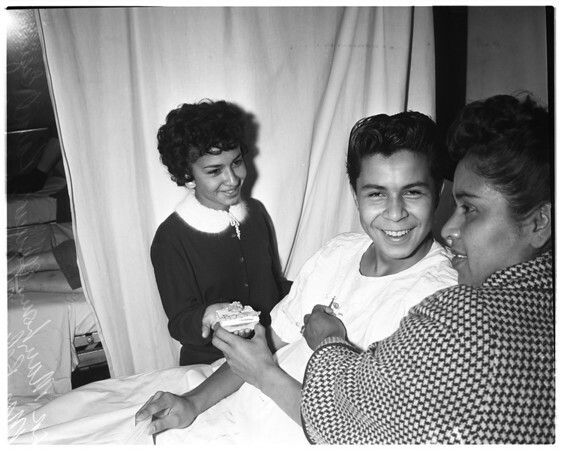 3-4: L to R: Mary Louise Aguirre, 14, gives cake to her boy friend, Raoul Esquivel, 15, in General Hospital, while his mother, Mrs. Belen Chavez, pins on his class pin in special ceremony paralleling that at school, where he is class president".